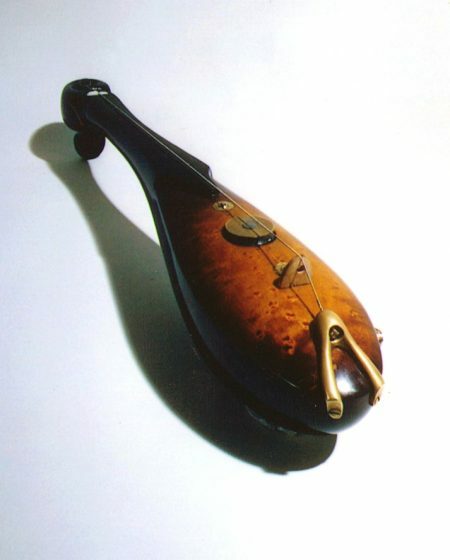 The E-Lute began a number of years ago by way of an unexpected and eye-twinkling email I received from the musician, Michiel Niessen, a lute player from the Netherlands. 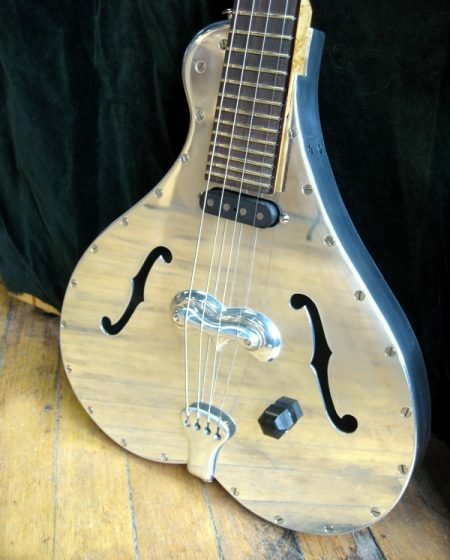 While I frequently get requests to make exotic dream instruments and field crazy ideas, many of these have to be weeded out as I discover that the premise for the design is either impractical, ridiculous, or simply something I never would be interested in making. 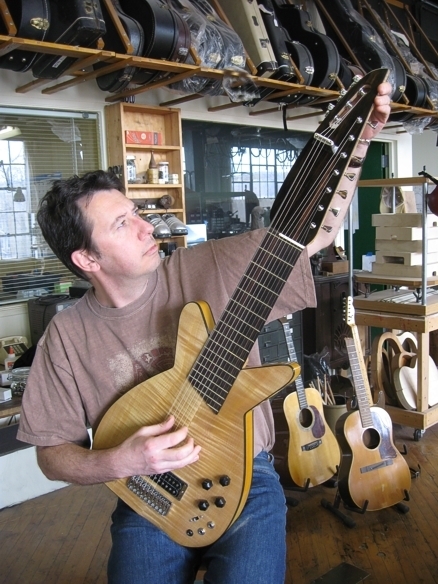 However, Michiel managed to convince me, through a series of emails, that he was indeed serious and that this instrument was something perhaps no one has ever tried, although in retrospect it seems like such an obvious idea. 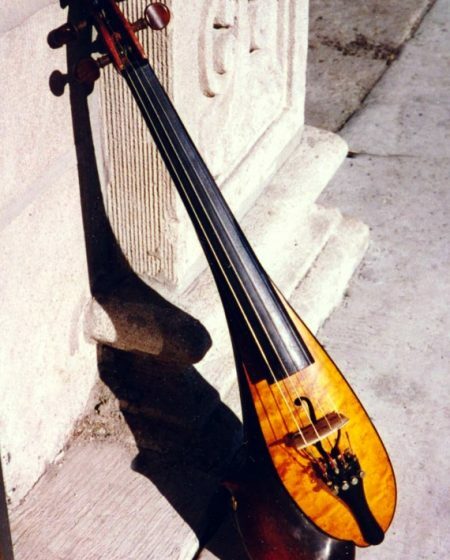 One reason for its absence in the instrument world may be that the repertoire of early music is enjoyed by a set of people resolute to hanging on to something precious and embedded in history. There is an obvious need to protect this, so an insulating layer exists between the modern and the ancient in this regard. I believe that Michiel realized that I had been tinkering with this idea of historical reference in my other work and that we shared a common goal: to strip away the insulating layer and to design and construct a modern counterpart to the medieval Arch lute, of which he is an accomplished virtuoso. This goal is not a light one. There were many physical obstacles standing in the way of this hybridization, this pulling of the past into the present, namely weight issues, structural issues, and aesthetic issues. In preparation for the work, I was fortunate enough to be able to study in person a traditional acoustic Arch lute Michiel brought by the shop. I took measurements, notes and familiarized myself with the geometry of the instrument. I also studied the book Historical Lute Construction by Robert Lundberg along with various lute blueprints from the Guild of American luthiers. 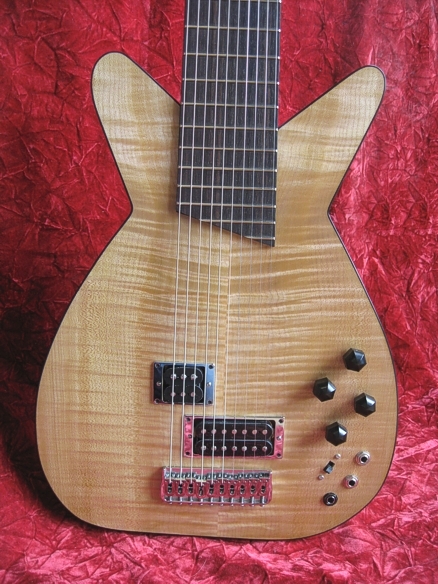 The E-Lute’s body shape is essentially an enlargement of my Maxwell model. When considering various ideas for the body shape I noticed that, rather remarkably, the lower bout of the Maxwell happened to be very close to the shape of a traditional Arch lute (with the addition of two massive “horns, however). 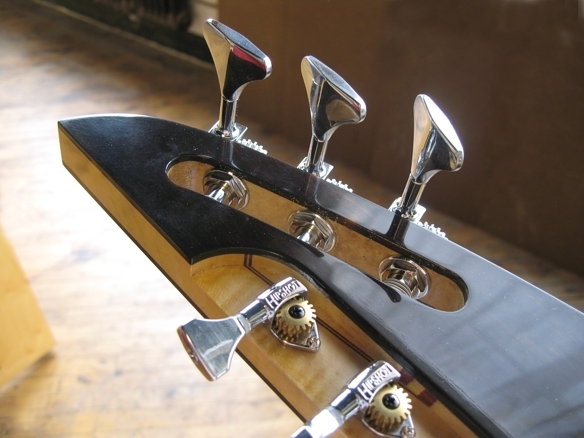 Moreover, the shape of the Maxwell’s headstock naturally lent itself to the placement of the bass riders with their three mini-bass tuners fitted into a slot along the left side while still having ample room for seven guitar machine heads on the right. Once I realized this juxtaposition was possible, I simply could not resist the Maxwell’s next evolutionary step. 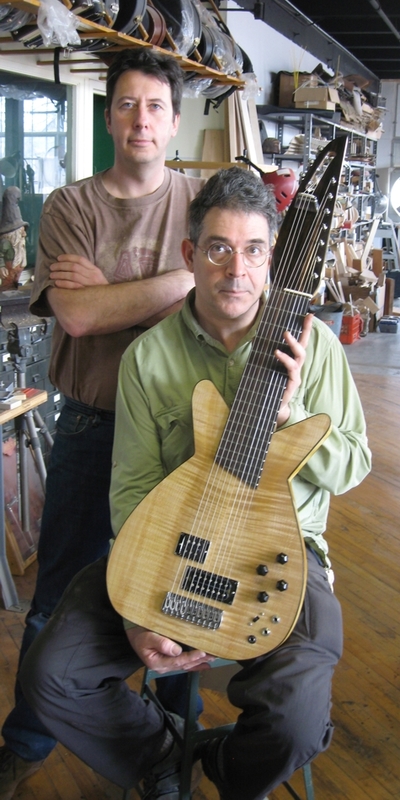 At this point in the project, ideas gradually began to take shape on paper; then the quest for materials began and I quickly realized I had to use fingerboard blanks wide enough for a six string bass, but cut to a 24 scale length. 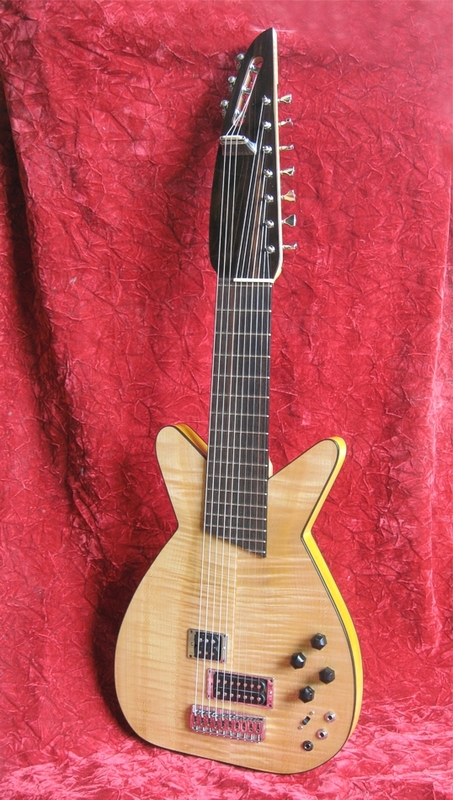 And, since steel strings are a fundamental criterion of the modern electric instrument but are at a greater tension than gut or nylon strings, three carbon fiber reinforcements were needed in the neck to counteract the greater tension. 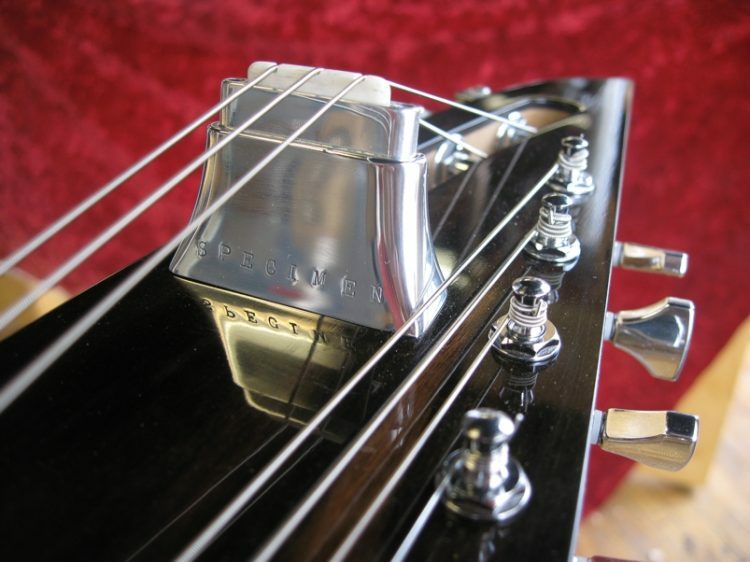 It was also required to use lightweight tuning machines to avoid the instrument becoming unbalanced with a ten-string headstock, three of these strings enjoying a much longer scale length than the others and supported by yet another metal mechanical contrivance – a floating adjustable nut and tree for the bass riders. The Hipshot Company came to the rescue with their fine, lightweight mini-bass tuners and their open-gear guitar machines. As for the floating adjustable nut and tree for the bass riders, that required a custom design, something I machined from an aluminum billet and stamped with the Specimen brand. 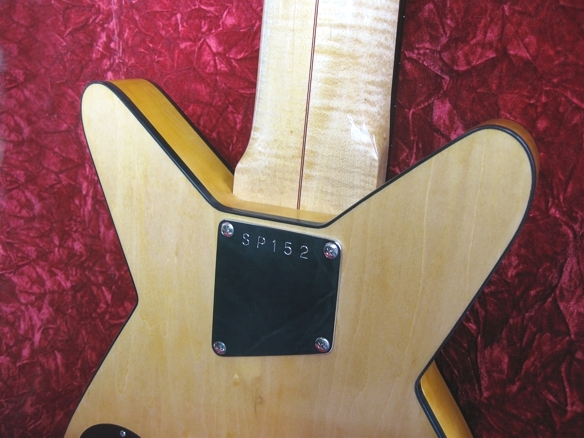 The neck was made using two pieces of quarter-sawn European flame-maple laminated with a blood-wood zipper down the middle. This is perhaps the only decorative element on the whole instrument. This was not intentional, as I had fully intended to mimic the tradition of lavish lute embellishment, but somehow the stature and austerity of this instrument resisted the idea of ornamentation. Instead I embraced the relatively minimal lines, letting the materials and geometry speak for itself. 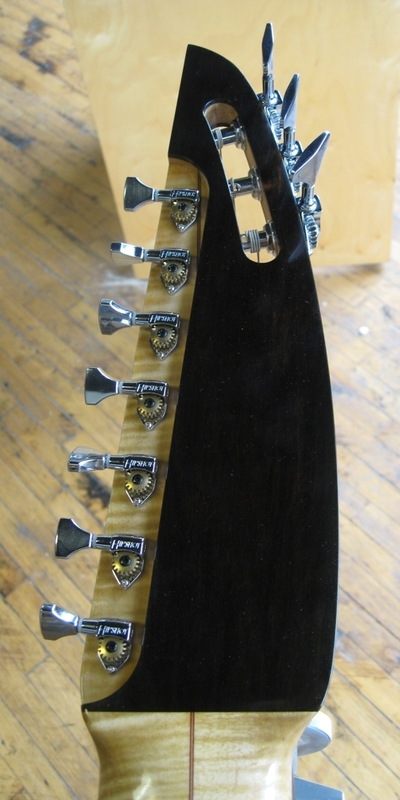 The fretboard and front and back headstock veneers were made using Madagascar ebony. 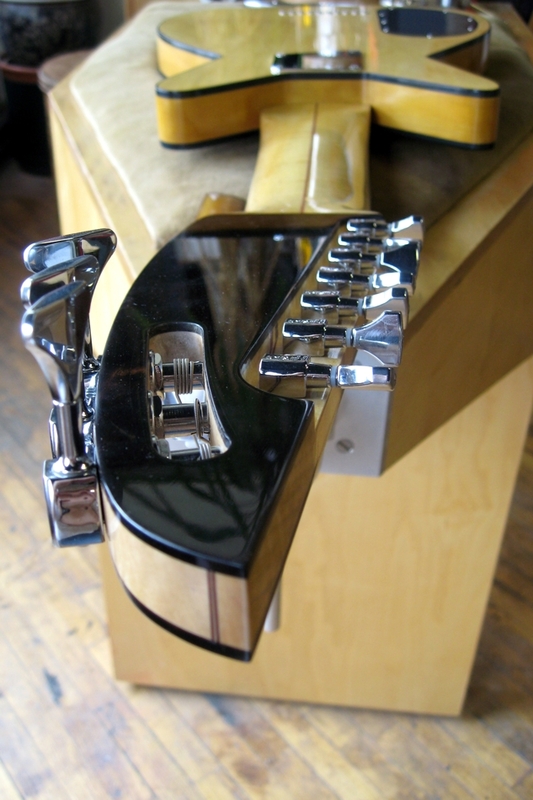 The headstock had to be “stepped” to accommodate the two types of tuning machines and through this, the structural requirements took on visual import. 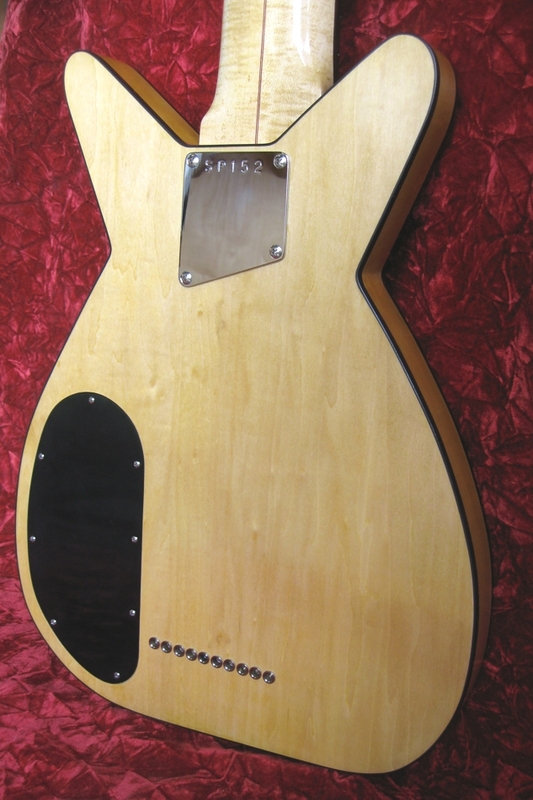 I have stared at the junction between the blood-wood zipper and the rear headstock veneer at the nape for hours in fascination and satisfaction. It is there, hidden from the audience, as a visual secret for whomever plays the instrument. 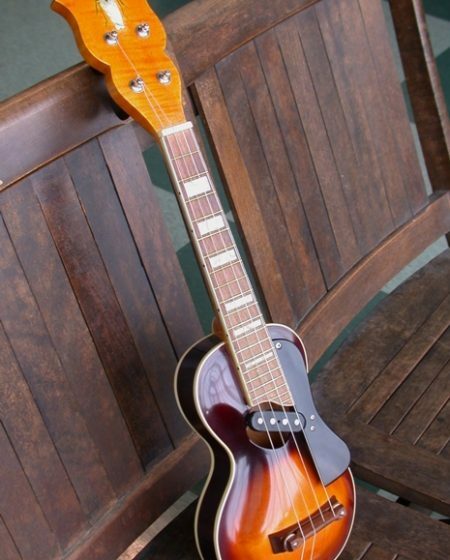 This electric lute features a stereo output that can be bridged mono or used with two amplifiers. It can be used with either mono 1/4″ plugs or tip-ring sleeve 1/4″ stereo cables. 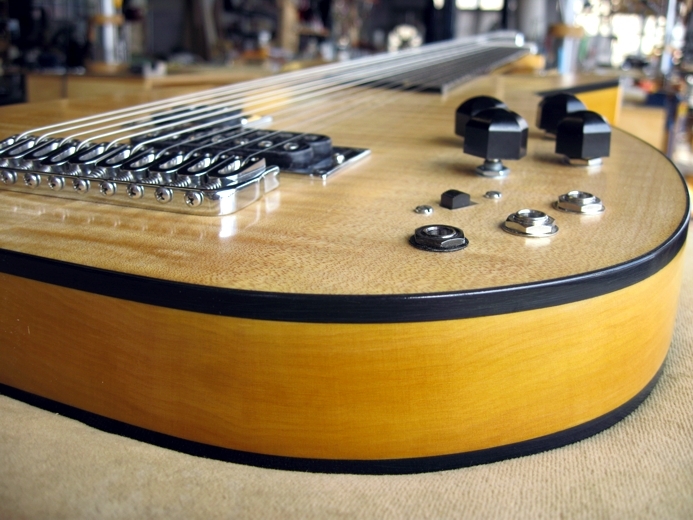 There are push-pull volume pots for each pickup with a coil tap function. There are also tone controls for each pickup and the volumes are additive like a Fender Jazz bass with no pickup selector. I have to admit there was quite a level of anticipation in the air while stringing the instrument up for the first time; I simply didn’t know if it would explode when up to tension. It turns out that it was well within engineering limits and the instrument performs very nicely. For those interested, the tuning of the E-lute is (from low to high pitch): C, D, E, F, G, C, F, A, D, G.